Welcome back to The Dog Pawlour blog! We are thrilled that spring is finally here! We’re sure that many of you living in and around Greeley are excited to get back outdoors with your furry friends in order to start enjoying all the outdoor activities Colorado has to offer. While spring is a time of renewal, rejuvenation, and regrowth, it is also the start of flea and tick season in Northern Colorado, which lasts from March to November. These external parasites carry and transmit a number of pathogens and diseases that can infect pets and owners. Therefore, pet parents will want to take care to protect their pets against fleas and ticks over the next several months and year-round, really. Below are some important considerations for flea and tick prevention at home and on the go. There are several effective options that pet owners can take to protect their dogs and cats from catching fleas and ticks. Because these external parasites are highly prevalent here in Northern Colorado, local veterinarians recommend implementing flea and tick prevention year-round. NexGard®, Frontline® Plus, and PetArmor® Plus are all easy, chewable methods for flea and tick prevention. There are also collars, specially formulated shampoos, flea combs, and sprays that can help protect your pets from parasites, so talk to our pet grooming team or your vet for more information about these preventative methods. First, and foremost, you will want to seal off your yard to keep out wildlife. Animals and rodents like coyotes, raccoons, skunks, mice, and stray cats and dogs can bring flea eggs and ticks into your yard. Fleas prefer to live in shady areas in the warmth of yard debris where moisture collects, whereas ticks prefer tall grasses, weeds, trees, and organic debris. Keeping your yard clean can reduce the risk of fleas and ticks settling in your yard. Weed and mow regularly, and inspect your fence lines for possible entryways where wildlife and strays could get in. Coloradans spend a lot of time enjoying the great outdoors with their dogs in tow. If you go hiking, biking, walking, or camping in the grasslands around Greeley or in the wooded areas to the west of Fort Collins, make sure to check your pup for ticks following any outdoor excursions. Inspect their skin, armpits, ears, and nether regions for ticks. You will want to remove a tick as soon as possible to avoid the spread of pathogens to your dog. This important tick study from Colorado State University’s Extension services will teach you more about ticks in Colorado and how to properly and safely remove them from you and your pets. Thoroughly brushing your dogs and cats at home will give you chance to inspect their skin and coat for signs of fleas and flea bites. If you notice signs of these tiny parasites, you will want to address the issue right away to prevent fleas from spreading to you, your family, your guests, and other pets and belongings in the home. 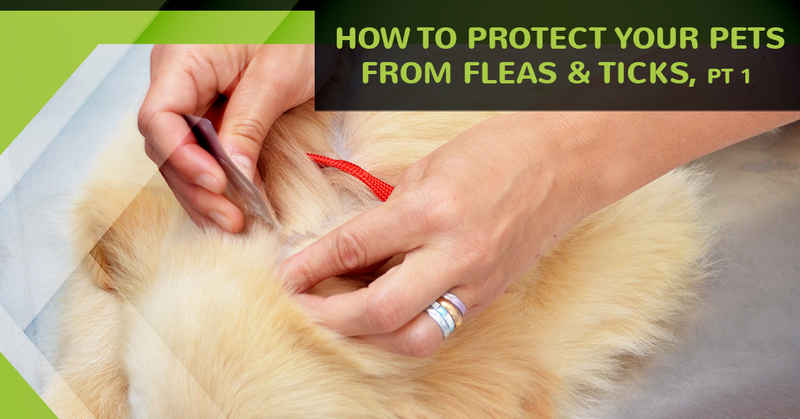 Grooming your pet regularly is one of the best methods for preventing fleas and ticks. Our expert pet grooming team at The Dog Pawlour checks your pet’s skin and coat during each visit to ensure there are no external parasites, signs of parasitic bites, or other skin irritations that would need to be treated immediately. If we notice anything suspicious, we will recommend next steps to remedy the situation right away so you and your pet can get back to living life to its fullest. To schedule your dog or cat for a day at the pet spa, call The Dog Pawlour, the Top Rated Local® pet groomers in Greeley today! Be sure to tune in for part two of this short blog series, as we continue exploring more ways you can protect your dogs and cats from fleas and ticks.